The Ancient Ram Inn is a well known haunted building in Gloucestershire. This property has a vast history and is Grade II* listed and was once former local Inn located in Wotton-under-Edge. 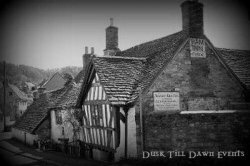 The Inn has been investigated by many paranormal investigaters over the years and the family that lived there were said to witness to many strange and disturbing occurences whilst living there. This is an atmospheric, yet terrifying place, not one for those of a nervous disposition!